This week I put up my first exhibit as Assistant Curator: “Edward Gibbon: The Luminous Historian”. Christopher Jones, a professor in the Classics Department is teaching a course this semester on Gibbon, the renowned author of The History of the Decline and Fall of the Roman Empire. You’ll have to stop by Houghton to see the full exhibit, which will be up until December 22nd, but I thought I’d share a few highlights here. Gibbon was a passionate book collector (in fact he once compared his library to a seraglio) but it was more than just a hobby: his tremendous collection of original sources in Roman history made the Decline and Fall possible. 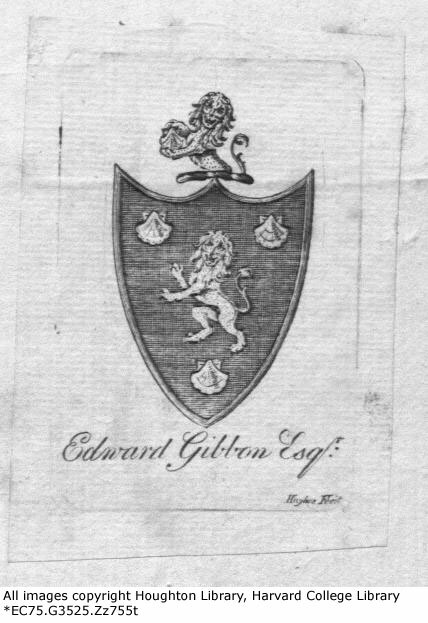 Houghton owns several books from Gibbon’s library, but I chose to show his copy of Taylor’s Elements of the Civil Law because it bears not only his simple booklabel, but also his less common armorial bookplate. 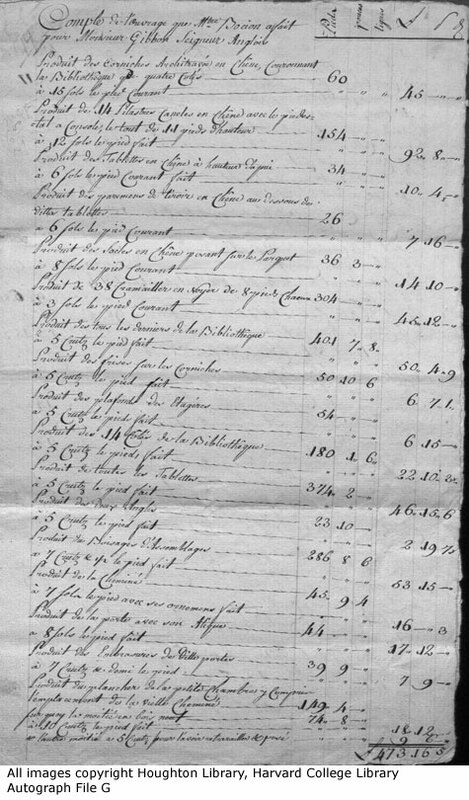 Perhaps the best way to get a sense of the scale of Gibbon’s library is this bill from a master cabinet-maker named Bocion, who constructed the library in Gibbon’s house in Lausanne, Switzerland. This is just page one of three, and the total comes to over £700. As we’ll see in a later installment, that’s almost as much as Gibbon was paid for the first volume of the Decline and Fall. Stay tuned for more from this exhibit.